The Soulscapes Tarot are the culmination of 25 years of research, study, meditation and reading Tarot cards for others. Esoteric Art and the Tarot. The creation of my first set of images or Major Arcana happened over the space of two years as an intense personal and spiritual journey of awakening and enlightenment. The minor Arcana I painted during the following year using the seasons of the year as focal points to connect with the four elements or treasures. 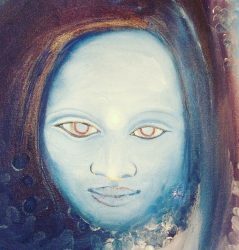 The Court Card images in the Soulscapes Tarot present Spiritual guides and otherworldly archetypes that I have worked with during my years of studying and working with Tarot cards. The intention with the Soulscapes Tarot was to capture the whole essence of that awakening journey to be presented as a complete system in which the full deck of Tarot could be used by any practitioner or spiritual seeker who wanted to initiate their own inward journey. Click on any of the links to learn more. The foundation for the Soulscapes Tarot has its roots in the Qabalah; the Tree of Life and other elements that can be found within the Western Mystery Tradition. If you view studying Tarot from the same perspective as you would if you were studying for a degree it takes just as much, if not more effort to produce the 78 images which make up a Tarot deck as it does to study for a University Degree Course. The Tarot is not for the faint of heart because it demands that you look into all of the undiscovered spaces in your self and that you be truly honest with yourself as you delve deeper into your own pool of resources and wisdom. You can use the Major Trumps of any Tarot deck as allegorical signs on a roadmap that highlight the major life experiences that are progressed through on the spiritual journey of enlightenment, and as a resource for reflection when you are in need of wisdom and guidance. During each journey of creation that I have gone through it has opened up more avenues and pathways into a future that I could never have dreamed of beforehand because up until I made the choice to step on to this particular path I was living an exoteric life. In a dream many years ago my late Grandmother Mary showed me a deck of cards with purple on the reverse and it wasn’t until I had finished designing and creating the first deck and had started to write this that I realised that she had shown me something that I was going to do. At the time I remember asking my Mum if there was a deck of cards that belonged to my Grandmother in the stuff that had come from her house when she passed away as I was convinced that there was a set of Tarot somewhere that had been kept in a wardrobe. Spirit works in mysterious ways and this taught me a valuable lesson that dreams, dreaming and information that we receive in the dreamstate isn’t always just our brains processing the things that we are dealing with in the physical world and that sometimes we are being pointed towards our future goals and at the time we might not recognise those signs.